Heinrich H. "Henry" Epp: farmer and developer; born 2 April 1902 in Wiesenfeld, Russia as the first born of six children to Heinrich Epp (1872-1935) and Anna (Goertzen) Epp (1877-1930). He married Anna Andres (1903-1980), the first born daughter of Peter J. Andres (1878-ca.1935) and Katharina (Penner) Andres (1880-1963) in 1925. They had no children. Until the time of the 1917 Russian Revolution Heinrich Epp lived in the area where he was born. With his parents, Heinrich Epp moved to Friedensdorf, Molotschna Mennonite Settlement during these years. He performed the obligatory state service with other Mennonite young men in Berdjansk. In 1924 he was invited to the wedding of his comrade Wilhelm Andres to Elisabeth Fransen, in the neighboring village of Marienwohl. Here he met his future wife, Anna Andres and they were married the next year. Heinrich and Anna Epp lived with his parents in the village of Friendensdorf until 1929 when he and Anna left Russia. They arrived in Canada in 1930 via Moscow and Germany. Except for Anna's sister Katharina, wife of Henry H. Janzen, all of Heinrich and Anna's siblings and parents from both sides remained in Russia. 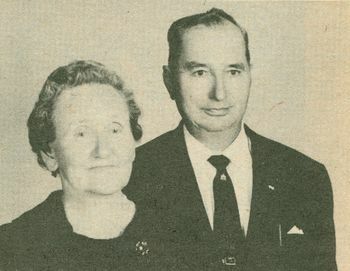 Heinrich and Anna Epp were initially received in Canada by the H.H. Janzens in Kitchener, Ontario before moving to Vineland. They were members of the Vineland United Mennonite Church when it became independent from the United Mennonite Church of Ontario led by Waterloo bishop Jacob H. Janzen. After working as laborers on various fruit farms for several years, the Epps bought a modest fruit farm at Jordon Harbour on Lake Ontario. When the Ontario Department of Highways built Canada's first inter-city divided highway (later named the Queen Elizabeth Way or QEW), connecting Toronto, Hamilton, St. Catharines and Niagara Falls, in 1939, the Epps moved to Vineland -- the highway having cut right through their farm. With their financial resources they later helped individuals and families immigrate to Canada after World War II, including his brother, and also financed several individuals' education. In Vineland, Heinrich and Anna lived across the street from the United Mennonite Home and Church, in a house they had designed and built themselves. Henry also built other homes in the area. They were remembered for their love of gardening. Flowers bloomed not only in the summer, but all year round in their solarium, a building feature that few other homes had at the time. Henry also bought, farmed, and sold several farms in the area.They celebrated their fiftieth wedding anniversary in 1975 at the Vineland United Mennonite Church with many friends and relatives in attendance. They were able to enjoy travelling in their later years including a trip to Germany in 1980 to visit siblings that had survived the Soviet era. Anna died that same year and Heinrich spent his last years living in the Vineland United Mennonite Home. "Anna Epp, Vineland, Ont." Der Bote (30 July 1980):7. "Goldene Hochzeit in Vineland." Der Bote (20 May 1975):5. GRANDMA (The Genealogical Registry and Database of Mennonite Ancestry) Database, 7.05 ed. Fresno, CA: California Mennonite Historical Society, 2013: #482034. "Heinrich H. Epp, 1902-1992." Der Bote (10 June 1992):6. Klassen, Maria and Alf Redekopp. "Epp, Heinrich H. (1902-1992)." Global Anabaptist Mennonite Encyclopedia Online. 17 March 2014. Web. 25 Apr 2019. http://gameo.org/index.php?title=Epp,_Heinrich_H._(1902-1992)&oldid=116642. Klassen, Maria and Alf Redekopp. (17 March 2014). Epp, Heinrich H. (1902-1992). Global Anabaptist Mennonite Encyclopedia Online. Retrieved 25 April 2019, from http://gameo.org/index.php?title=Epp,_Heinrich_H._(1902-1992)&oldid=116642. This page was last modified on 25 March 2014, at 20:25.